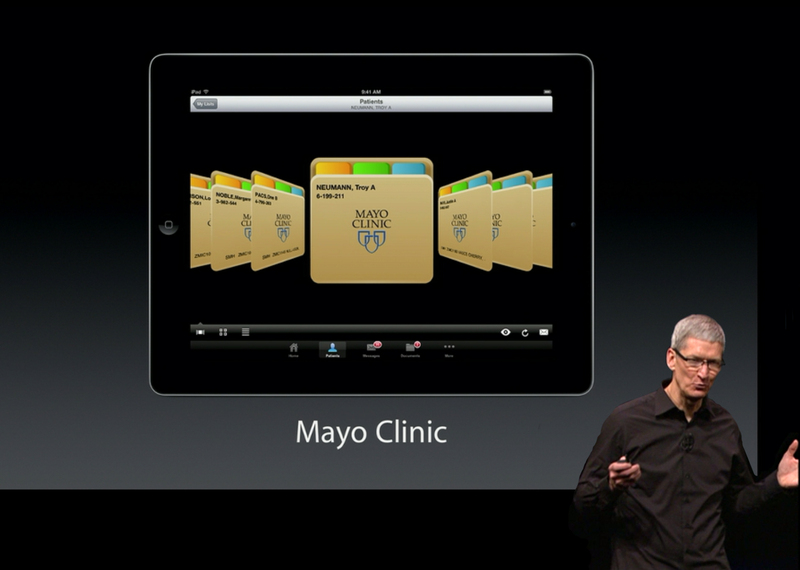 Tim Cook mentioning Mayo Clinic's app at the 9:39 mark of his keynote. On Wednesday, in San Francisco, Apple CEO Tim Cook took the stage in front of a crowd of tech-hungry journalists, bloggers, tweeters and photographers who were sharing with the world every word of the nearly two-hour keynote. Aside from the big iPhone 5 announcement, Apple highlighted ways various businesses are using their mobile products. Talking about companies that are creating their own apps for both iPhone and iPad, Tim says "...or this one from Mayo Clinic, which helps thousands of doctors deliver better patient care" within of the first 10 minutes of Wednesday's keynote. The app that he was referring to and the one you see on the iPad in this photo is called SynthesisMobile. Mayo physicians use this app each day on iPads and iPhones to access patients' electronic medical records (EMR), dictate clinical notes, view lab results and do many other patient-related tasks. Mayo Clinic developed this application because physicians wanted a mobile, easier and faster way to access patient information. 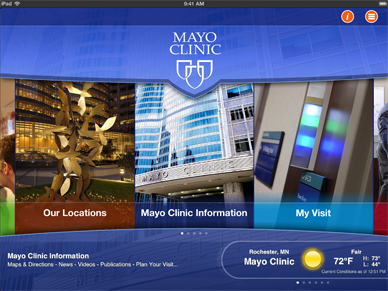 The iPad and the SynthesisMobile app helped saved a man's life at Mayo Clinic's Health Living Center earlier this year. In March 2012 Mayo Clinic launched the Mayo Clinic Patient app, designed to help patients with a quick and accurate way of accessing their personal health information, online appointments, lab results and more. You can download this free app for your iPhone, iPad or iPod Touch from the Apple App Store. Watch this video to learn more about this useful app. We shared this story on Mayo Clinic's Facebook and Twitter. I work in a web design company and we tested several different software in this industry but still we believe Mayo Clinic is te best and I’m happy to hear they use iPad to deliver the best result.